Don’t Miss an Important JA Community Event! 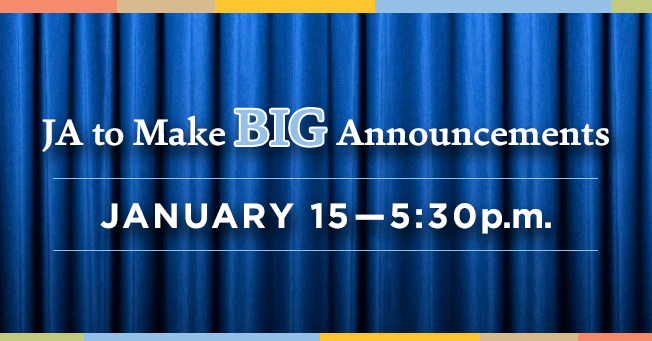 Join the JA community at 5:30 p.m. January 15 in the Performing Arts Center for two significant announcements. Refreshments will be served by the JAA. Everyone who attends will receive a gift item. The Student Council will provide childcare. Don’t miss this event where we’ll reveal the collective thinking and work of our JA community in two important areas. Hear the new, revised wording of our historic mission, developed through a careful, yearlong process of gathering input from students, faculty, staff, parents, trustees, and alumni by members of the Mission Statement Task Force. JA engaged Mindpower, an Atlanta based branding and marketing agency, to assist us in identifying and communicating the unique strengths and qualities that make JA the very special school that it is. This branding exercise has not been about developing a tagline or a logo, but instead about discovering and powerfully demonstrating who we are as a school. Mindpower has done that by diving deep into our school and listening intently to focus groups comprised of our students, faculty, staff, alumni, trustees, and parents. Lisa Jordan with Mindpower will be on campus to present and reveal what they discovered about JA. She has already presented it to the Board of Trustees, and it is very powerful and incredibly affirming of our wonderful school. This event for all who love JA will surely be a time of celebration and affirmation of Jackson Academy. The JAA started this year with a wonderful focus on uniting the community with the Unite event, and January 15 will be another way we will come together to celebrate The JA Way and all that JA provides to our students, families, alumni, and community. Join your JA friends and family January 15 at 5:30!